Acid Opulence 3 Robusto is a strong, spicy, and floral smoke in a 5x54 Robusto Extra vitola. I found the Opulence 3 to be a delightful mild and lightly flavored smoke. A bit more flavor would have encouraged me to give it a 5 across the board, but it's a wonderful cigar! Great Cigar!! Just the right size. Great Box Well Made. Smell great!!! I found this a well built cigar with a smooth easy smoke. There is a note of honey at the start and continues mild throughout. 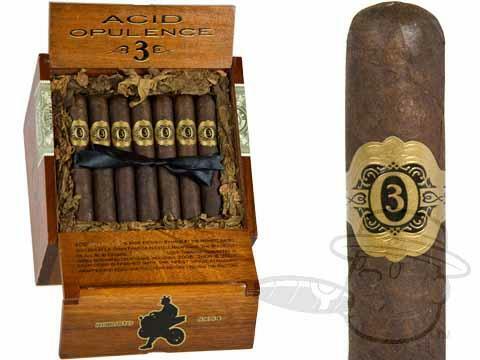 Acid Opulence 3 Robusto is rated 4.5 out of 5 based on 8 customer ratings.